Report: Sagaba Konate Out for the Season – What’s Next For Sags? According to a tweet from Jon Rothstein of CBS Sports and SI, Sagaba Konate will be out for the remainder of the season. Konate has not played since 12/8. For most Mountaineer fans this was a foregone conclusion and this announcement was merely a formality. Sources: West Virginia's Sagaba Konate (knee) is not expected to return this season. Has not played in a game since 12/8. One of college basketball's top shot blockers. Konate has been out for the majority of a massively disappointing junior season. The goal coming into the season was for Sags to come back, shoot three-pointers like Ray Allen and then be a lottery pick in the 2019 NBA Draft. Instead he has barely played and his future is very up in the air. All was not lost during the 2018-2019 season. Konate did show his old for when he put on a show against the rival Pitt Panthers. The big question is what’s next for Konate? After a dismal junior season there is almost no chance he gets chosen in the upcoming NBA Draft. Him coming back for his senior season in Morgantown was almost an impossibility going into his junior season, but what other option does he have at this point? Outside of going overseas or hoping to catch on in the NBA G League, there aren’t many other options. Next season West Virginia has incoming five-star recruit Oscar Tshiebwe coming in. Him and Konate are fellow alums of Kennedy Catholic High School in Pennsylvania. Does the prospect of mentoring the incoming big seem like an intriguing situation for Konate? Imagine a team with Konate, Derek Culver and Tshiebwe as the top three big men. That has to take Huggins back to the glory days in Cincinnati with bigs like Kenyon Martin, Danny Fortson and Corie Bount dominating the paint. Time will tell, but one thing is for sure. 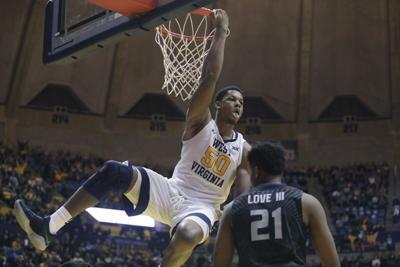 The 2018-2019 West Virginia men’s basketball season has been a massive disappointment for Sagaba Konate along with the rest of the team. Hopefully Sags comes back for his senior season and joins up with Culver and Tshiebwe to create one of the most fearsome front lines in Mountaineer history.